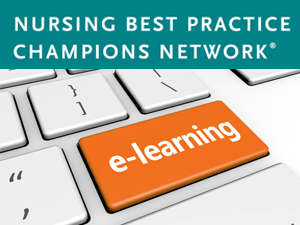 To further engage individuals as champions and improve accessibility to the Champions workshop, the Best Practice Champions Program has created a learning series based on the content delivered at the in-person Champions workshops. This learning series consists of four modules using a hybrid approach for content delivery. Modules 1 & 4 are archived webinars, and modules 2 & 3 are combined into one live three hour webinar. Similar to the in-person workshop, participants are introduced to BPGs and how to implement them using the Toolkit, however in a modular format. After each module, participants are expected to complete a series of reflections and activities based on the content presented within the module. After completion of all four modules, participants will be awarded a certificate of achievement, added to the Best Practice Champions Network(r) database, and identified as Champions. Modules 2 & 3 will focus on identifying, reviewing and selecting knowledge, adapting knowledge to local context, stakeholders, & resources and assessing facilitators and barriers to knowledge use and selecting, tailoring and implementing interventions and strategies.